Occasionally there is a canvas that never makes it to competition. 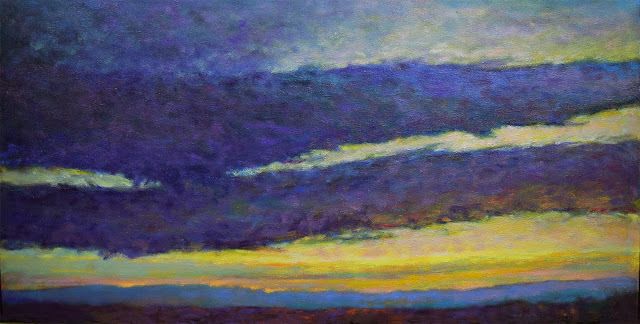 Soft Sunset was one of those pieces, continually evolving, presenting more problems and demanding a good finish. I have a few of these problem works currently stacked in the studio, patiently waiting for the last brushstrokes to pull it all together. This canvas was started at least three years ago and for whatever reason, I found the solution last week. The painting was too bright with a number of colors competing for attention, keeping it out of balance. I made a big move by adding grays to almost every part of the canvas, allowing just a bit of the original, brighter colors to gleam through. After that, it was a matter of some color and contrast adjustments, a pleasant task. My sincere thanks to the collector that purchased this for her home.